I thought we did this once a year? Guess not….bring on the icy hot…. Can you post the smurph? I can’t attend tomorrow but would love to try! No murph. 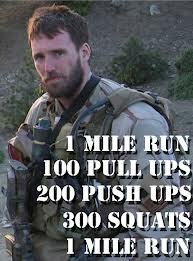 1000 burpees instead. 1:14:35. That’s awesome. You beat me by 8 minutes. Are you going to compete this year in the crossfit games?